When I decided to create kecoughtan.com in the late 1990's I was motivated to do so by the dearth of information on the internet about the history of Kecoughtan Lodge and the Order of the Arrow on the Peninsula preceding Wahunsenakah Lodge. The site was developed by W. Scott Smith (1993, 1994 SR-6B Chief) of Tutelo Lodge 161 and Michael F. White (1995 SR-6B Chief) of Shenandoah Lodge 258. A few years ago I noticed that the site was no longer online, and emailed the authors requesting permission to make its content available here. They kindly assented, and today I still consult the valuable reference they created for historical information I've been unable to locate anywhere else. 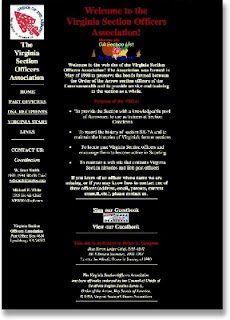 Take a trip down memory lane and visit the VSOA site, archived at kecoughtan.com with a salute to Scott and Mike for their pioneering efforts to preserve Virginia OA history on the web.